Having gone through some significant volatility this winter, electric and gas prices have settled down. The current year prices are still impacted by the year’s persistent natural gas storage deficit. We’ve had just enough cold weather across the lower 48 states this winter to maintain a substantial deficit. The expectation is that natural gas storage inventories will end the withdrawal season at about 1 Tcf, requiring about 2.5 Tcf of injections to reach a comfortable 3.5 Tcf for heading into the 2019-2020 winter. Natural gas production is around 10% higher than last year through the first quarter. EIA is projecting continued increases in production as we get into warmer weather months. 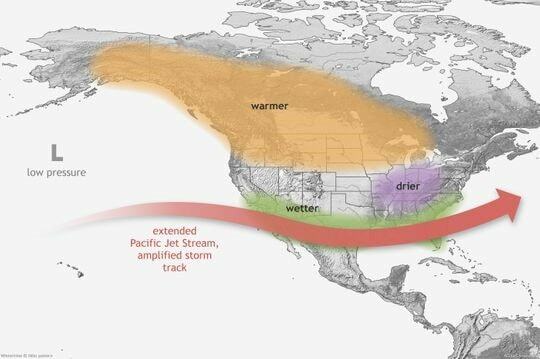 We are looking to the longer term weather forecasts for some insights on what to expect for power demand.There is a weak El Nino in the Pacific. An El Nino would typically mean drier and milder than normal temperatures in the Northeast and Midwest.